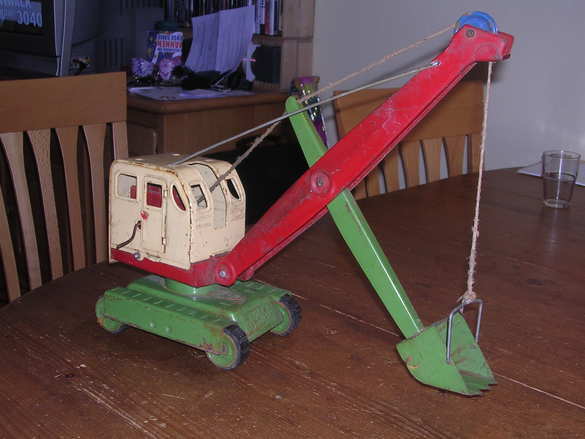 This great crane is a Zis 150 in a remarkable condition. Look at this lovely detailed truck. 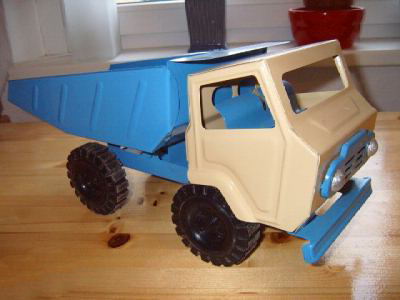 This Zis serie is much smaller ( 32cm) length than the early and Camocean trucks. Very rare is the removable petrol tank !The hook also is precision work! It's registration number is 1400. The Zil 150 had a brother or if you like, a sister. 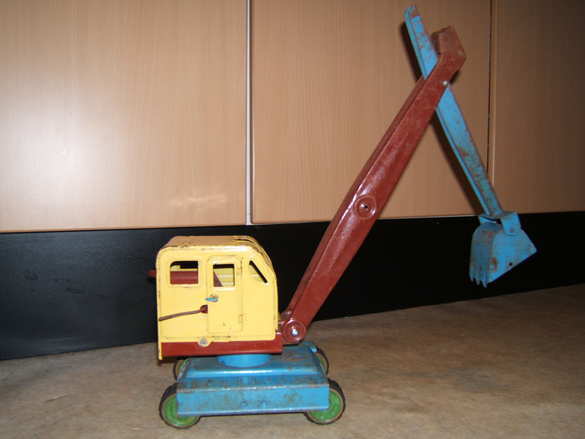 It is equipped with a grab and 1468 as registration umber. Just like the former 1400, this truck has wheel hubs with a sign stamped in. If this ZIL130 "Samosval" was made by Camocean is not sure. Like the first ZIS models it has a number plate with a serie number?? I discovered your site with a lot of enjoyment. All these trucks, it is magnificent! In a few days we shall make new photos of the Zis 150. You can use them without problem. From my part, I shall add a link towards your page, which is very interesting. The truck of fire brigades is a miracle!!! 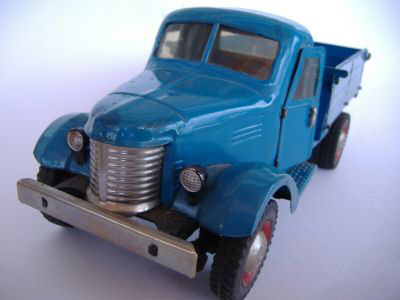 I have two other new ZIL 130 trucks, at home. On this subject, their real name is "Samosval", which means "dump truck"
PS: It's only an elementary school, I like technology so I try to initiate my pupils to sciences, mechanics, meccano ...etc. who was so kind to sent us the photo's of this lovely coloured Van. It seems to be a Christmas Van with Santa Claus on its way to children. 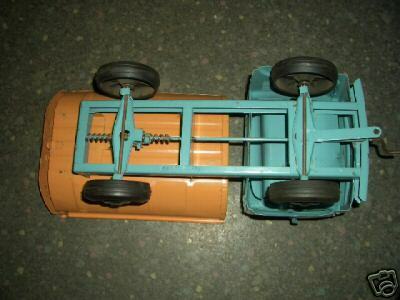 This Van is 24cm long, 11 cm width, and 10 cm high. 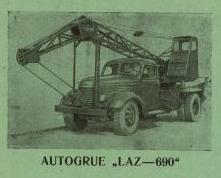 It has he same headlights as the crane. January 2009 this Van appeared. June 2010, I received more detailed pictures which shows these lorries have a clockwork. 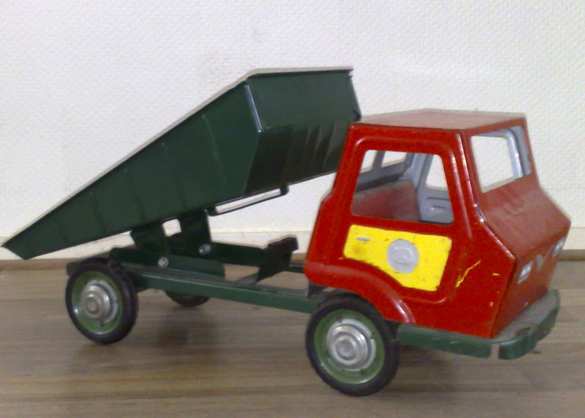 In the same series this is another model, a Tipper. 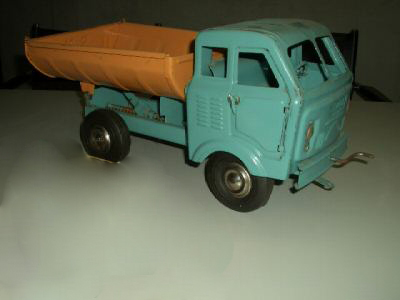 This Tipper with a length of 33 cm could be another one in the Zis serie. Below the tipper has a spare tyre. This truck has a clockwork. By lifting the number plate (!) up or down this clockwork will release or stop. These truck were also made in Russia. By the Sim factory. It has the same marks as the other trucks. SIM made a various amount of models in this series. 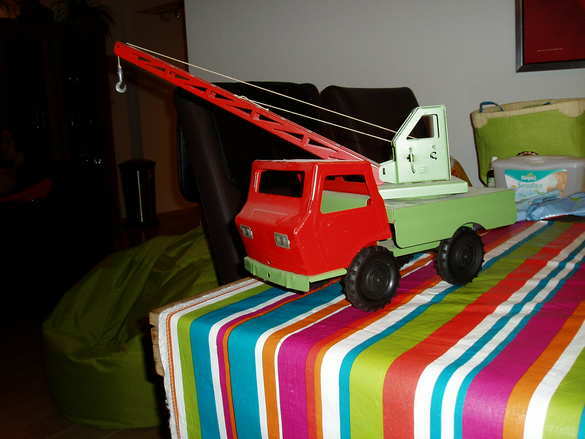 A Fire truck, a Tipper, a Crane and a Bread truck . 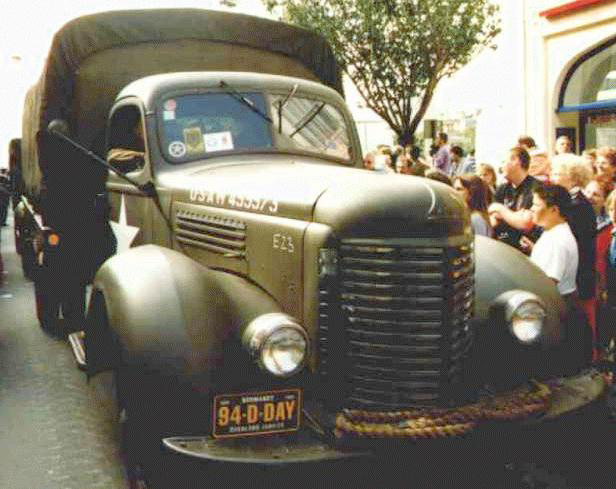 In october 2009 , I found the below shown truck in the Ukraine. 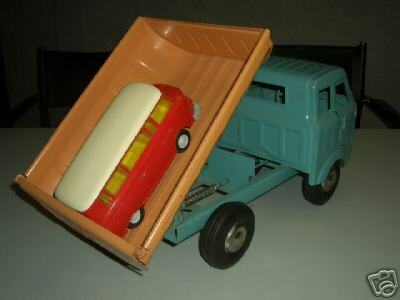 It could inspired SIM to make the trucks below. The printed 19-90 in the back of this tipper indicate that this tipper was made in 1990. 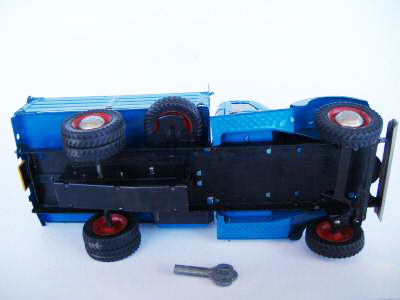 However looking at the overall truck the model is not a 1990 one. Perhaps to reduce the production costs all models in this serie just have chrome headlights but a grill was to expensive (?) A close up of the bonnet shows the factory who made these trucks : "SIM"
This fire truck has the same front as the tipper shown above and seems to be from the same serie . It is dated 1984. It has great features. The ladder goes up to 90 cm. The crane of the SIM series has on one side of the cabin the production year and the other side of the cabin SIM. 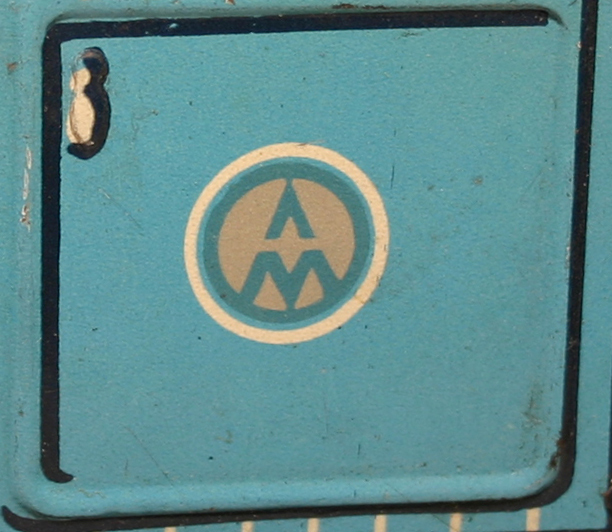 To indicate this ugly series is not easy.It has no marks like all other Soviet trucks. Some tippers have a printed: "made in the USSR. 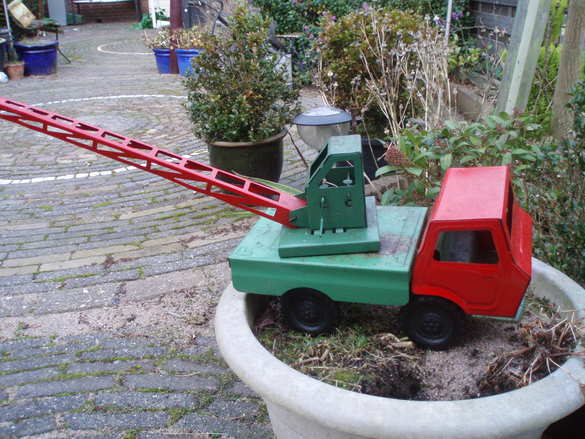 There are a truck with trailer a tipper and a crane in this series. Perhaps do you know anything about these Soviets trucks? 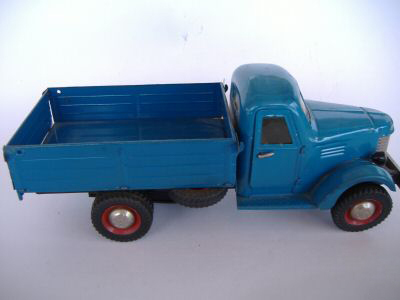 The KAMAZ serie might be the last serie of Soviet trucks.Just like the Tri-ang Hi Way series these models are missing their soul. This Soviet Caterpillar with a length of 47(!) cm is very rare. At first thought you should think that this caterpillar has tracks . Turning the caterpillar however shows that it are little wheels with rubber tires. The Caterpillar had several printed marks. Don't ask me the meaning of these marks as my knowledge of the Russian language is zero. To show how big this caterpillar is, I took a picture of it in front of a large Tri-ang Double Deck bus. The caterpillar has a brother : a tank. 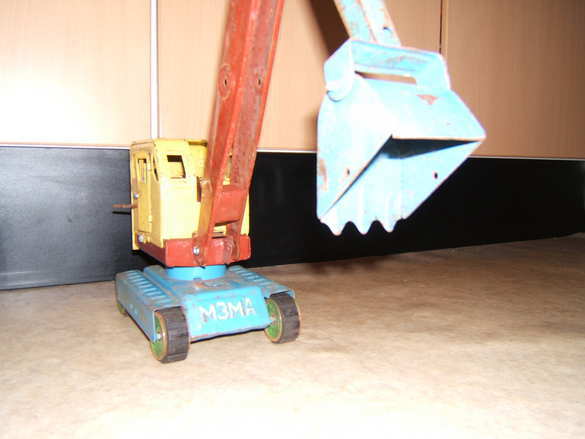 At the home page of the Soviet models, we show several massive excavators. Who would guess that the same factory put it on a crane chassis? A lovely, scarce model! In contrary to the regular cranes, this one has double iron wheels. 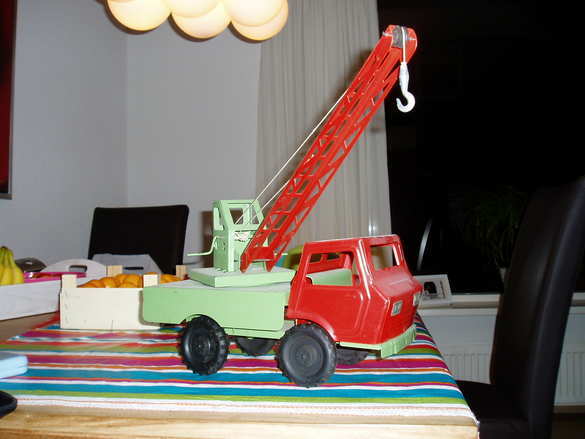 the size of this crane is length 23 cm, wide 29 cm, high 48cm. 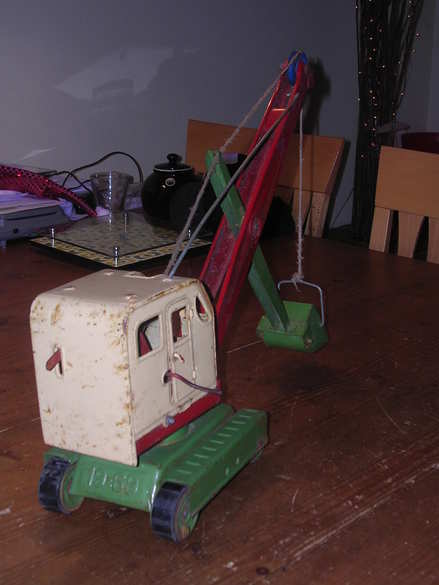 There was also another excavator crane of the same size. . See the pictures on the right . 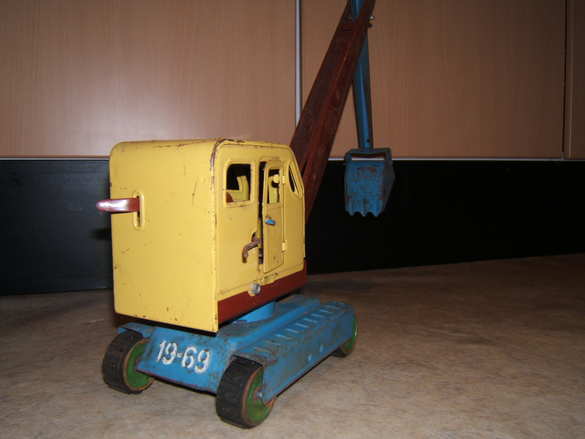 The heavy pressed steel Soviet cranes were made from 1949 until 1993. The cranes were equipped with a grab. All Soviet cranes should have boom braces. They are moveable between the front or rear holes on the cabin. ( look at the black arrow) At first thought you should think that these crane shave rubber crawlers. 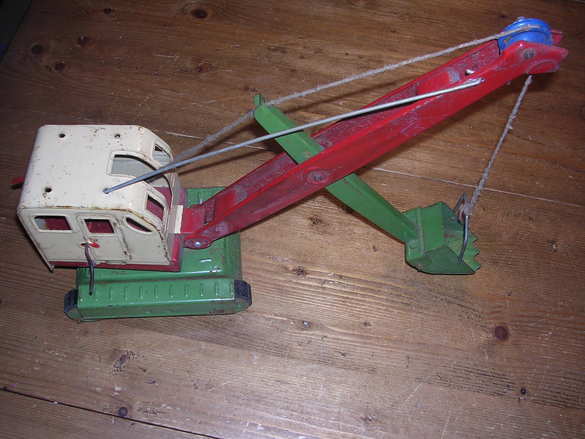 Turning the crane however shows that it are little wheels with rubber tires. Some cranes have a wrench to fit the boom. As you can expect most of these wrenches were lost.